Time to get to work on stairs. First step is to actually make the entities and get the exit logic working. I’ve managed to get all the actual loading parts of stairs working, and have reworked system enabling/disabling so animations can play during any exit transition. Actually building the stairs animations is rather error prone, at the moment I’ve got the first half of going up stairs working alright. The rest will have to wait for later. I also need to make some changes to rendering to make sure multi-level entities (like the door frames) render appropriately. Now all animations for stairs are working. 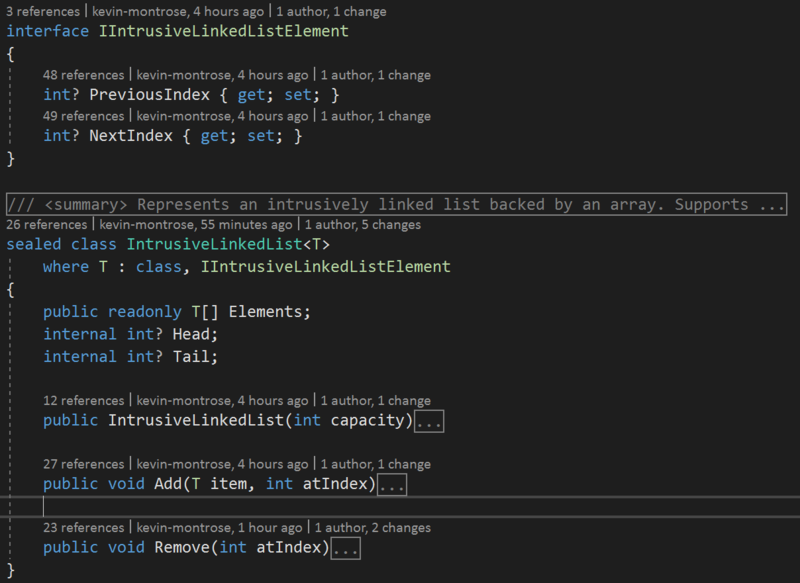 I’m not in love with the code I’ve written, but it will do for now. There’s one more exit type – pits – I want to tackle, but I need a break from fiddling with sprites and animations. I’m going to detour into component reuse / object pools for a bit, and come back to the final exit type. Busy social day, so I’ll probably only get a little bit done on the new exit types. We’ll see. I’ve got the basic infrastructure for going through a door setup. A door is composed to two entities, a frame and the actual door, in a manner similar to a player being composed of three entities (feet, body, and head). As with the player’s feet, the door’s state is owned by just one of the entities (the actual door). The door’s state is composed of just the target room and the tile coordinates to come out of. I’ve yet to actually implement the transition, but the idea is fade out while the player is still in the first room and fade back in once they are in the new room. Door transitions are now complete. The basic idea is quite similar to scrolling transitions, there’s a Step counter, a call from the FrameStateManager to get how much to fade, a new room loaded, and old entities released. 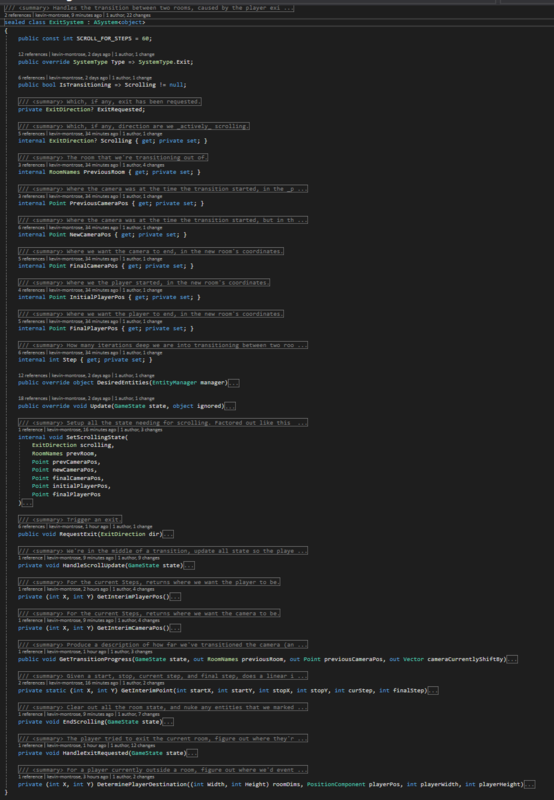 I wouldn’t call it the cleanest code, but it works well enough – especially with a gin and tonic in hand. Stair-style transitions should be almost identical, except a special animation will play. At the moment the animation system is disabled during an exit transition (you can see this by watching the flower fade in on the right in the gif above), so that’ll require some work. The various hitmaps also need some work, as you can see the “pushing” animation happens on the door frame and it’s quite easy to get stuck on the door’s edges. Tomorrow is the last day of the holiday weekends, so I don’t know how much coding time I’ll get – but I should be able to make some progress. I’ve done a little more cleanup work this morning. I’ve removed entities from the BushSystem (so it no longer needs special compacting), and I’ve moved the compact calls into a new CleanupSystem. I like having cleanup in a system of its own, since then I get the same profiling as all other systems. 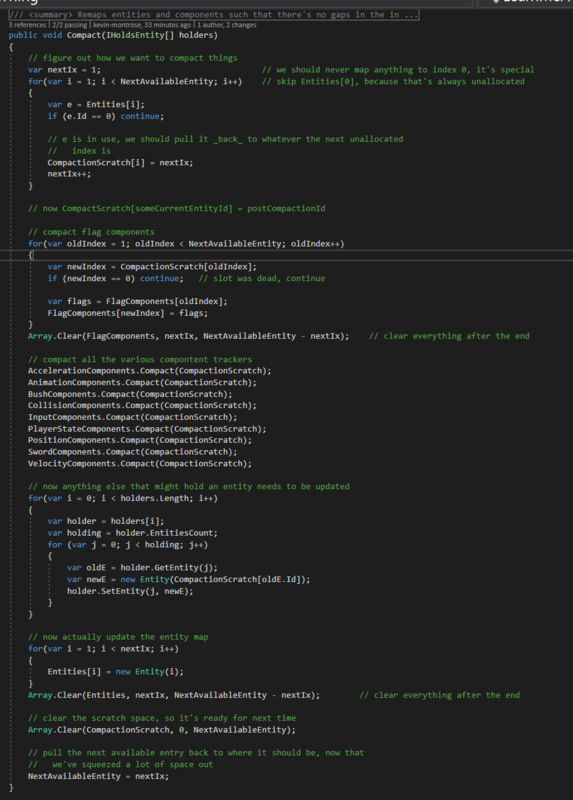 I’ve also decided that, at least for now, I’m going to trigger entity compacting every 100 GameState advances, when the ratio of dead entities to live one is >= 2, or when the EntityManager reaches the end of it’s backing buffer. Triggering any of these conditions resets the iteration count, so logically this means we’ll compact at least once every 100 iterations but may compact more frequently. Reliably compacting entity storage also let me change the NewEntity() method into a simple bump allocator, so that’s nice. I’ve decided today that I’m going to work on room transitions. A random aside, I threw a memory profiler on a DEBUG build out of curiosity. It’s nice to see that there’s basically no churn once things settled down after app start. At the moment, the only actual allocations are creating new Components. At some point I’ll move those to an object pool, and then we should get to actually zero allocations during normal operation. I’ve now got the very basics of edge-triggered screen transitions working. There’s still a lot to do, for one the camera isn’t really aware of transitions which results in it lurching forward at the start. This approach is pretty generic in terms of keeping things where they “belong” during a transition, and involves a minimum of new code. The only tricky part was getting the math down for transitioning between the rooms – I’m not convinced it’s completely correct. I’ve been fighting a headache for an hour or so, so I’m going to call it for today. Tomorrow I’ll focus on fixing up the camera’s behavior, making sure transitions work between rooms of different sizes, and getting some test cases in. If you pay attention to the trees you can see the old entities getting culled at the end of the transition. The camera jump is apparent as well – it’s a consequence of the camera always wanting the player to be in the center of the screen, unless at a room’s edge, and the logical removal of aforementioned room’s edge.